The Life Skills Mentoring Program uses a combination of interactive coaching activities to address the readiness of high school level young adults for employment. The lessons will be taught weekly in 45-minute classes. The Reentry Life Skills Program will seek to disseminate information to ex-offenders with the purpose of educating them and empowering them to move past their present situation and become identified as productive, respected members of society. The Veteran Assistance Program assists returning combat veterans to reintegrate into civilian life. The Pastoral Care Program is an advocacy effort to find practical methods of incorporating spirituality into the mental health programs of individuals that may not have previously considered its benefits. Of particular concern is mental health in the African-American community. 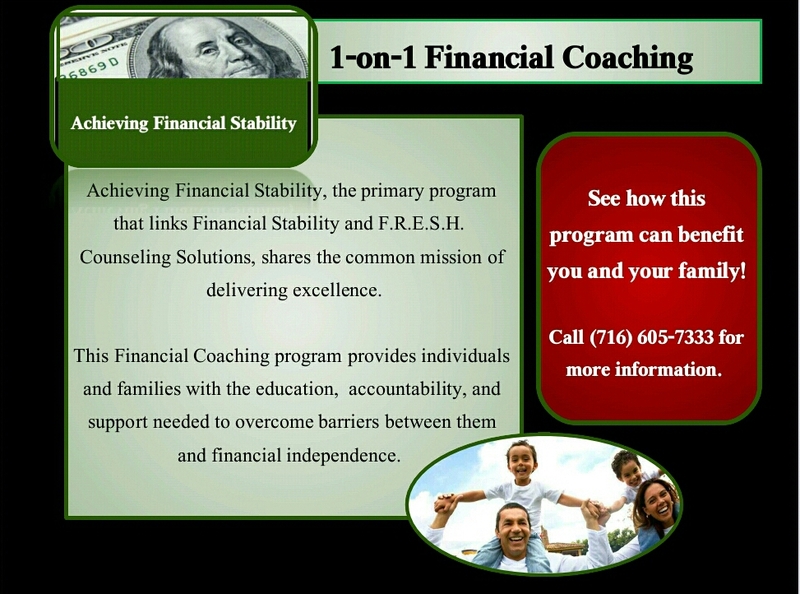 The Financial Education Program is a joint venture by Kevin LaMar Sr., CEO of F.R.E.S.H. Counseling Solutions, and Jeffrey LaMar, CEO of Financial Stability. The mission is to build community relationships by educating clients about available financial options, empower them to pursue those options, and assisting clients to meet financial responsibilities and ultimately achieve financial security. F.R.E.S.H. COUNSELING SOLUTIONS. Buffalo, NY.